Llenes Cave is located in the Pre-Pyrenees of Lleida, in the municipality of Conca de Dalt (Pallars Jussà), specifically on the West side of the gorge called Erinyà canyon formed by the Flamisell River at 7 km North of La Pobla de Segur. Erinyà canyon is an unusual geological place, which presents a stratigraphic series of limestone from Late Cretaceous period. The entrance of the cave is located 100 meters above the present course of the river. The total length of the cave is about 185 meters by adding a lateral gallery. The entrance of the cave has around 2.5 meters height by about 3 metres width and is oriented 17 degrees South-Southeast. The height of the site is 750 meters above sea level. 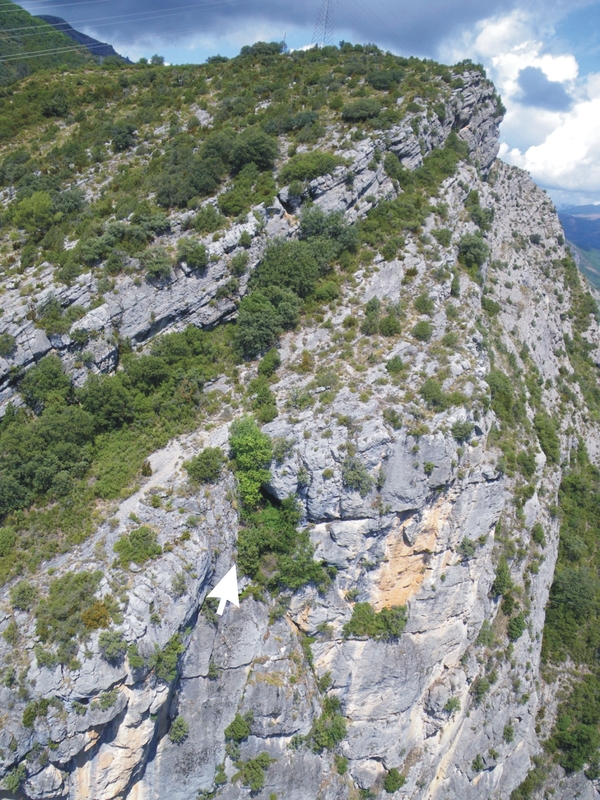 The cave was dug in the 50s by J. Maluquer de Motes into the framework of Prehistory of the Institute of Pyrenean Studies in order to find Neolithic remains. The study shows a stratigraphic sequence in which a basal stratum containing Pleistocene remains, including cave bears, has been described. This fact was the main cause of a first excavation season in 2013 by the current research team. This first campaign was focused on the entrance of the cave where the team dug around 25m2. The preliminary results show a stratigraphic sequence that has 8 levels so far. The first six levels are altered and have a mixture of materials belonging to different periods of the Holocene. Level 8 is the only one that presents in situ material from Middle Pleistocene. Remains of bears (Ursus spelaeus), hyenas (Crocuta sp.) tahr (Hemitragus sp.) and red deer (Cervus elaphus) are recovered as well as middle Palaeolithic lithic tools mainly elaborated on quartzite and hornstone. The raw materials seem to come from rolling stones of the Flamisell River. The relationship between fauna and lithic industry is determined by the presence of cut marks and anthropogenic fractures. However, the most important activities carried out in the cavity appear to be related to carnivores.